Brenden was working with his team on their bot during our 2013 Finals Competition, when Mike Valoski (Parkway West’s Machining teacher at the time) pulled him aside and introduced him to David Jacobs of DF Jacobs Consulting Inc. Valoski stated that Brenden was the best draLer in Parkway West’s program and that Jacobs was looking to hire talented draLsmen to work on a contract he had with Kawasaki and NYCT (New York City Transit). Brenden was hired shortly thereaLer by Jacobs for a summer internship with DF Jacobs Consulting Inc. and is still currently working on projects for him. Zach never thought about manufacturing as a career option until he joined his school’s BotsIQ team and started working with his industry mentor at L&S Machine Company. Now, he cannot imagine working anywhere else and L&S Machine Company is glad to have him on their team. Kenny participated on the team through the Robotics Club at Fayette AVTS. Although he originally planned to be an electrician, aLer his experience with BotsIQ he decided to continue his studies and to become and electrical or mechanical engineer. 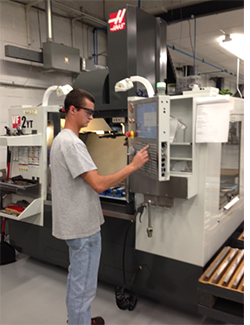 Kenny worked as a co-op at Advanced Acoustics Concepts (AAC) in Lemont Furnace during the school year. His experience with BotsIQ helped him on the job; and his on-the-job experience helped him with BotsIQ work. BotsIQ really helped me pick my major and excel in school by teaching me a wealth of knowledge about mechanical and electrical components and how to make them work together. It also taught me valuable lessons in teamwork and sportsmanship. I always wanted to do some type of engineering but after building a battlebot, I decided that mechanical engineering is for me.